You will need Node 11+, Yarn and React Native 0.5+ installed on your machine. Experience with React Native will be helpful. In this tutorial, we will build a chat app that can play mp3 and mp4 files right from the app itself. Knowledge of React and React Native is required to follow this tutorial. You’ll need a Chatkit app instance with the test token provider enabled. If you don’t know the basics of using Chatkit yet, be sure to check out the official docs. This tutorial assumes that you a least know how to create, configure, and inspect a Chatkit app instance. Lastly, you’ll need an ngrok account for exposing the server to the internet. In order to save time for building the crucial parts of the app, I’ve created a starter branch in the GitHub repo. This contains the server, login, and navigation code. We will only briefly go through what each one does, so I recommend you to check out my previous tutorial if you need a more detailed explanation of what the code does. We’re also using a package called React Native Audio Toolkit, but it doesn’t play nice with react-native link so it’s better if you just follow the instructions from their installation doc to manually link the package. This error occurs because both React Native Gifted Chat and the project needs to use the React Native Video component. This leads to the name conflict that you see above. Removing Gifted Chat’s copy prevents the issue from happening, though it’s not the ideal solution. A GitHub issue was already created for dealing with this, so keep an eye on that issue if you’re reading this in the future. Since we won’t be going through the code of the server and login screen, I’ll just provide a brief overview of what they do. The Login screen is used for getting the username of the current user and their friend’s username. The friend’s username doesn’t already need to have been created with Chatkit when this happens. The Login screen is responsible for passing the Chatkit user ID (returned from the server when the user is created), username, and friend’s username to the Chat screen. Note: The onLongPress isn’t really ideal for production apps. What you want instead is to overlay the video’s thumbnail preview with a play icon. When the user clicks on it, the modal for viewing the video will show up. You can pass the renderMessageVideo prop to Gifted Chat to implement this. If you want to learn more about animations in React Native, I recommend you to read my tutorial on it. If you’re wondering how the calculation for the remaining duration works, remember that this.player_duration is the total remaining duration in milliseconds. We’ve set this to default to the audio file’s total duration. On the other hand, the value returned from stopAnimation is the current value of this.progress when the animation was stopped. This can be a value between 0 and 100, so it actually represents the actual percentage of the animation when it was stopped. This means that we can simply use a percentage formula to figure out the completed milliseconds based on the value that was returned. This is the one thing that the React Native Audio Toolkit didn’t provide. It’s the main reason why we used animations for the progress bar for the AudioPlayer component. You can also use the ChatBubble component to create a custom preview for video attachments. 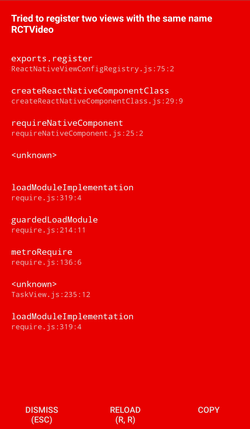 Don’t forget to delete the node_modules/react-native-gifted-chat/node_modules/react-native-video if you haven’t done so already. That’s it! In this tutorial, we built a chat app with React Native and Chatkit that can play audio and video files. Building the app was easy, thanks to the help of the various packages. Add support for viewing image files - I’ve previously written a tutorial which has implemented this feature (Create a file-sharing app with React Native) so I didn’t include it in here. React Native Gifted Chat already has a feature for showing images so all you have to do is use it. Add support for other media file types - For other video and audio file types, you most likely have to stick with mp4 and mp3 as those are the most common formats. So if you want to add support for other file types, you need to create a server for uploading the files and convert it from there. Add support for document viewing - React Native PDF and React Native Doc Viewer are two packages which really looks promising. Cache files locally so they can be viewed offline - you can use the React Native Fetch Blob package to implement this. Add audio and video recording feature - for audio recording, the React Native Audio Toolkit package already has you covered. All you have to do is create the UI for recording. For video recording, React Native Camera comes with the option to record videos. You can find the project’s code on this GitHub repo.